What happens when two galaxies meet each other in the dark alley of space? Well, if you're around in 4 billion years, you could find out first hand when the Milky Way and Andromeda galaxies are predicted to collide. In the meanwhile, kill some time and help researchers with Merger Wars. Merger Wars is a new citizen science project and an international effort between researchers at George Mason University in Washington, D.C., and the University of Oxford, looking for ways to simulate galaxy collisions occurring elsewhere in our universe. 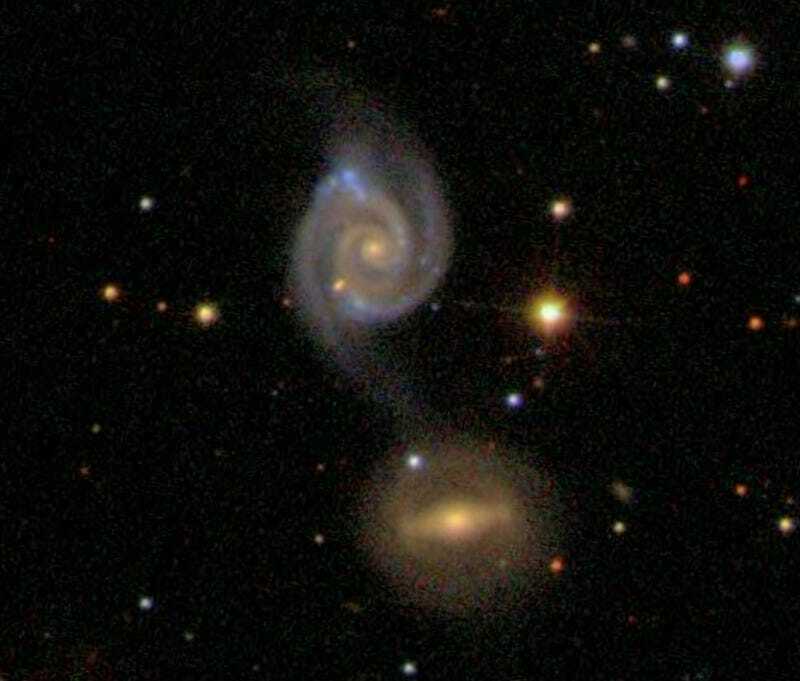 While playing Merger Wars in their web browser, players are shown an actual picture of two galaxies merging, along with two images generated via computer simulations. Simulations of merging galaxies battle it out in a "tournament" style, with players selecting the best approximations, which are then scored and the most selected ones are passed on to researchers to further optimize the simulation. Two images from the simulation are compared to a "target" image, with the user given the option to select which one of the simulations matches the target best, or if both simulations are epic fails and don't match the target at all. In each round you play, a total of 64 simulated images will battle it out to see which one best fits the actual image of a galactic merger. When galaxies merge, individual stars are often too far away to collided into each other, as galaxies have a lot of empty space. However, the gravitational pull of one galaxy often distorts the features of another galaxy, and this is what you are looking to pay close attention to in Merger Wars. The best way to look for possible matches is to look at these distorted features in the galaxies – particularly the "tails" at the opposite ends of a merger and the "bridges" between galaxies. When making your selections, it's important that the tails and bridges of a simulation are going in the same direction as the target, and are of approximately the same size. You can work on the simulations themselves as well through the adjacent citizen science program, Galaxy Mergers. This is a little more detail intensive and works through an in-browser Java applet that shows an actual picture of the target galaxy surrounded by eight simulations. Players can take a real part in this research by choosing particularly good simulation from the eight options, and then altering the simulation in order to improve it. This is one of the most detailed features I've ever seen in a citizen science project; with the applet allowing users to add or remove stars, change the size of the galaxies, flip the galaxies, and change the speed at which they rotate in order to match the image of the merger. This is not an easy task, one that will challenge some of the best citizen scientists out there. These altered simulations are then placed into the Merger War tournament to provide additional data for researchers. Merger Wars provides two great avenues to practice some amazing citizen science. Got a few seconds and want to provide some data on simulations? Click through a couple images and help judge simulations. Want to really get your hands dirty? Start with one of their simulations and try to improve it yourself – it's a nice challenge. Either way, you are helping scientists learn more about the eventual fate of our galaxy. Images courtesy of Galaxy Mergers, with the top image being one of the mergers being studied currently on the site. If you would like to learn more, a Galaxy Mergers tutorial is available as well.